Geoffrey Ricardo is a friend who I came to know through my housemate's father. The first time I met him, he allowed us to sleep in his attic which was filled with colourful toys and other knick-knacks that would be out of place anywhere. In fact Geoffrey's house is a bit like that, there is detail everywhere, every surface is covered with something which catches the eye and implores you to notice it. On this first meeting I was able to walk through Geoffrey's workspace which is a beautiful old shed in the bottom of his garden. It is covered in lithographs and prints, as well as small sculptures. It was a fascinating look into his practice, which is both industrial and delicate, to the extent that I even refrain from calling it his 'studio' that we visited, because there is so much poly-filler, plaster, steel and copper strewn everywhere that you feel like you're in a 'factory or a workshop, more than you do a traditional artist's studio. I knew that he had been commissioned in the past to do larger scale sculpture works for public spaces as well. As we were leaving his house I noticed a giant copper elephant in his driveway, too big to fit under his car-port. That is the kind of thing that can only happen at Geoffrey's house. We kept in touch, and earlier this year he told me that he'd been commissioned to do a series of sculptures in the area along Kororoit Creek, near his house in Altona. I lived in Williamstown for a year or so when I was 19, so I was familiar with the space where his sculptures would reside. He asked me for a short piece of writing about one of his eight figures. To digress for a moment about ekphrasis (poetry written in response to works of art), this was a particularly interesting challenge. Because often the artist is absent and will never read the poem about the work, there is some room for the poet to experiment without needing to appease the artist. In this case, given that I was submitting the poem about the artwork to the artist himself, I was more than a little concerned about making it adhere as closely as possible to what I thought Geoffrey might have been intending. I read up on Geoffrey's other work, I went through my diaries about living in the area and went on google maps to remind myself of the landscape. I read some artist statements that Geoffrey had made on receiving the commission and asked him a few questions about the piece in emails. When I started writing the poem, it seemed like there was a very obvious way to approach the subject of the poem -- from the perspective of the figure looking up. So I wrote this poem. Given that the figure is anthropomorphic, but not 'human', I treated the subject as a sculpture with thoughts, not as a person. Given that the sculpture gets to experience daytime and nighttime staring up, I tried to convey in the poem a suggestion to passers-by, who, it felt to me, were being compelled by the arrangement of these sculptures along this path, to take a moment and reflect. the downside is you’ll be gone. But I wasn't completely satisfied with this poem. It seemed too sensible. Ginsberg has a great quote that says something along the lines of: poetry is not supposed to toe the party line. Lacan says: we do not come to poetry for the getting of wisdom, but for the dismantling of wisdom. So I thought about what someone in the clouds might be experiencing. 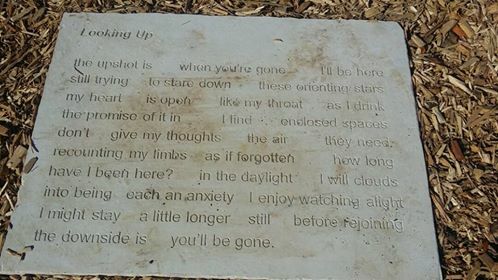 Whilst the people walking on the path have stopped to read these poems and look at the sculpture, I felt like the sculpture would itself be enough to encourage them to look up. I wanted to write about what someone looking down would be thinking. In this way, it carries the same message as the first poem (to take stock of your surroundings), but this poem is different in that it rejects the premise that things are better in the sky, away from the rush of human life, and that instead, the beautiful things in life are contained in the space around us. In this way I wanted the two poems to read first as an invitaiton to look up, and second as an invitation to look around. To hold the reader in a moment of contemplation of what they couldn't see or touch, and then leave them with the things that were right in front of them. I probably should also explain why the poems have such odd space between the clauses. Given that I knew the words were to appear in concrete, I wanted the poems themselves to be sculptural, so that when they appeared on the ground, they would have their own unique and 'concrete' (in the Apollinairean sense) shape. This stems from a lot of the research I have been doing into ekphrastic poetry, in that it should aspire to the same status as the artwork that it is responding to. I thought it would be fitting to have a 'sculptural poem' alongside an actual sculpture. Here is a fantastic video of Geoffrey talking about his work, which is shot mostly in his studio/factory/workshop. Also here are some pictures of the installed works. It's pretty cool to think that these poems get to live outside and that I was able to work with Geoffrey, who's art I find absolutely fascinating and inspiring.